Fibromyalgia patients are often prescribed a host of medications like antidepressants, anti-inflammatory drugs, opioids, and non-opioid analgesics. While these medications can help to control symptoms in this chronic condition, opioid painkillers may actually worsen outcomes in fibromyalgia patients if used for long periods, according to new research. Previous studies have shown that exercise therapies and chiropractic care may offer a safer, non-drug method for alleviating pain in fibromyalgia patients. Now a new study shows that acupuncture can also provide effective relief for several fibromyalgia symptoms. 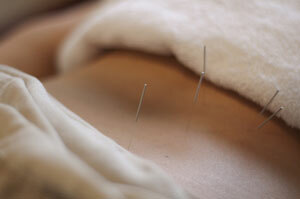 The study included eight women with fibromyalgia who were treated with acupuncture. Practitioners applied acupuncture needles to five active tender points in the upper body. Researchers measured patients’ pressure pain sensitivity, or their ability to tolerate pain. They also evaluated anxiety, depression, quality of life, and symptoms using a number of questionnaires. After eight weeks, the patients had improved symptoms including a 78% reduction in anxiety scores and a 55% reduction in depression scores. They also had substantially decreased pressure pain sensitivity, better quality of life scores, and many noted reductions in gastrointestinal symptoms. Researchers highlighted a number of possible mechanisms behind this improvement in symptoms. Fibromyalgia often causes patients to develop trigger points, or hyperirritable points of pain located in taut muscle fibers. These active trigger points have increased levels of chemicals like SP and CGRP, which activate and sensitize pain receptors. This is associated with sensitization of the central nervous system, affecting your ability to properly process pain. Acupuncture needles have been shown to decrease SP and CGRP chemicals, which corresponds with the clinical observation of immediate reductions and tenderness in pain after acupuncture. Written by: Marissa Luck on August 2, 2013.Modified on July 30, 2013.